EARLY 18th CENTURY HISTORICAL TREKKING-LIVING HISTORY-HISTORICAL REENACTMENT-PRIMITIVE WILDERNESS SURVIVAL SKILLS-PERIOD LIVING SKILLS-LATE 17th CENTURY TO EARLY 18th CENTURY CLOTHING, EQUIPMENT AND ACCOUTREMENTS-WOODSRUNNERS-WOODSMEN-WOODSWOMEN-WOODLAND INDIANS. THE NEW ENGLAND COLONIAL LIVING HISTORY GROUP IS NOW ACCEPTING RECRUITS FOR THE MILITIA AND SCOUTS. jOIN OUR GROUP OR OUR FORUM. This is the official site and forum for the New England Colonial Living History Group. Interests for forum include:17th-18th century living history and historical trekking, period living skills, primitive wilderness survival skills, period equipment, arms and clothing of the 17th to early 18th century woodsman and woods-women. Check this site for the information you seek. If it is not available, then please post your enquirie here on this blog. Picture of some very nice red sashes . One shows a beaded pattern on the body of the sash and both feature beaded fringes. The beads are no 7 French white glass beads. Sashes for 17th-18th century colonial New World living history, historical trekking and re-enactors. Early 18th century style woven & beaded sashes. We have a number of loom woven wool sashes of the correct style for late 17th century to mid 18th century. Some are plain & others are beaded with French No. 7 white glass beads. 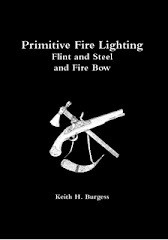 The new book Primitive Fire Lighting-Flint and Steel is still available. This book answers many questions about 17th & 18th century (and earlier) flint & steel methods, plant tinders, tinder preparation in camp, wet weather fire lighting, emergency methods, & much much more. There was a certain amount of research went into this book, but many of the plant tinders are of my own finding. I cannot say whether or not colonials or Aboriginals used any of the tinders I found, but I would imagine that if a person had a need or an enquiring mind, and then it is possible that they too may have found and used these tinders. The Australian Aboriginals certainly used the yacca plant for carrying fire, and as there are yacca plants in all states of Australia there was probably no need to go looking for any other plants. The colonials in Australia must have used something, but I have found no info to suggest that they used any of the plant tinders that I have discovered. The fungus and punk wood used in Britain, Europe, and the New World is a matter of historical fact. Fungus tinders in Europe and Britain were sold uncharred, and were soaked in potassium nitrate, but this method was likely only used in populated areas and I would imagine used more in the city than in villages. This is not mentioned in my book because I did not see the need. Nor is the method of soaking tinder material in urine, because I have had no positive results by this method. All the tinders work very well once charred, and this is the easiest and most practical method to use. If for some reason one were to run out of charred tinder (and you should always keep some spare in your pack, and remember to make more when your tinderbox supply is getting low), there are emergency historical methods mentioned in my book. The oµcial newƒletter of the New England Colonial Living Hi¥ory Group. At our last meeting the fire lighting workshop had to be cancelled due to lack of attendance. Our next meeting will be on the 2nd of December, and this will be our xmas gathering. We may have a Barbeque outside, depends on the weather. www.usedguns.com.au You might want to check this one out Tony. Last time I looked they had a Bluderbust !!! Oh drool. Can new members and prospective new members please return membership forms and membership application forms ASAP. New members need to pay the $16 insurance fee to the Australasian Living History Federation. You can either do it through me, or you can send the money yourself, but remember to let them know which group you belong to if you send payment yourself. Make sure the forms include your postal address, it helps me to be able to contact you by mail, such as sending you this newsletter rather than getting someone else to pass it on! A reminder that this is a good time to be working on your period clothing and equipment needs. It does not have to be costly, if you use second hand materials. Check out the op-shops, Vinies and Salvoes, for linen & cotton tablecloths or good clean bedding. Leather garments & shoulder bags can supply leather needs. Look out for those cheap Chinese school-type knapsacks. They can be converted to period. Second hand butcher knives can be found at the market & in second hand dealers. Mark, you may want to check out The Woodland Confederacy, woodland Indians on the net. Become a member & then you can post questions on their site & have some contact with other New World native decendance. 1WANTED. A ƒecond hand Brown Beƒs for one of our members. Early model preferred, but anything conƒidered. Earlier Items in A Later period. 18th century clothing of the common man on the New World Frontier. Clothing styles on the frontier was slow to changes, and people had their own preferences and tended to make things the same way as they always had, this applied to women’s clothing as well as men’s. When recreating the early to mid 18th century, it is good to remember that not all of your clothing and equipment will be new in that era, some items and styles will date back into the 17th century. As an example, let us say that you are 40 years of age and the year is 1710. That means that you were born in 1670. In 1690 you were 20 years of age. One could assume that you would still have some items of equipment or accoutrements from that period. If your Parents had given you something of theirs, then it would date back even further, and further again if your Grandfather had given you something, his folding knife or tinderbox for instance. Another thing to remember is that early items of clothing and equipment can be used in a later period, but later items cannot be used in an earlier period. For instance if your main period of interest is say 1700-1760, like mine, then the same period clothing and equipment could still be used in say the American Revolution period of the 1770s. The man’s shirt: The shirt needs to be long, knee length at least. Don’t forget that woods women can wear the same clothing as the men. The waistcoat: The waistcoat too should be long, reaching almost, if not entirely to the knees. Breeches: The breeches should be French fly and not falls. The frock: The frock it seems was commonly the shirt-frock. This style is the pull-over type, closed front, open neck with no buttons except one button on each sleeve cuff. If you need more information, don’t hesitate to contact me. Mark, a member of the New England Colonial Living History Group, is now the proud owner of a new shirt and sash. The shirt is linen and he did all the hand stiching himself. The sash is one that Carolyn made and is a beautiful red,purple colour with beading. Mark is a knife maker and a bowyer. A man of many skills.